Any business that offers bulk merchandise of any kind really needs some top notch tools so customers can easily help themselves to your goods. Sell more product by allowing your patrons to dish up the perfect amount with these Large Aluminum Scoops. This aluminum scoop provides a great way to dispense bulk items such as dry foods, coffee, and candies. Each candy scoop is built to withstand heavy commercial use and are a wonderful way to keep hands out of the merchandise and preserve freshness. The one-piece aluminum construction gives you the lasting durability you need. 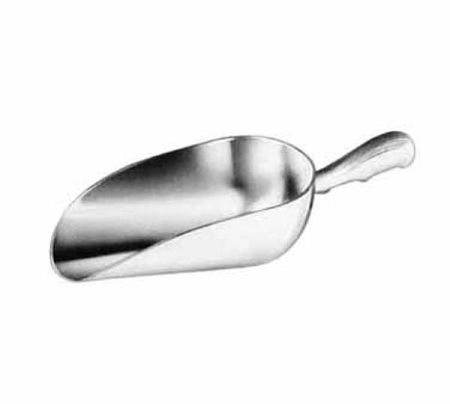 There is a sleek stylish appearance to this scoop that will go nicely in any store or shop you place it in. Built complete with finger grooves which allow for comfort and a secure grip. With the ability to dispense just the right quantity of each and every item that customers desire, it opens the possibility for a customized shopping trip that will produce happy buyers. What are you waiting for? Purchase several today!